To make a rather broad generalization, many urban fantasy series tend to feature protagonists that seem to be either from the wrong sides of the tracks with a dark history, borderline con men, or they belong to some sort of barely mentioned supernatural crime fighting group that operates in secret within the bowels of a real world police force. American authors tend to lean more towards the former, while British authors lean to the latter. Peter Grant is the main protagonist in Ben Aaronovitch’s series. He’s a London cop training to be a wizard. 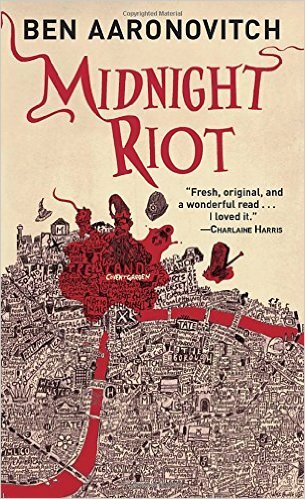 Midnight Riot is the first book in the series, and I have a review with some SPOILERS after the cut. The novel opens with Peter and his colleague/unrequited crush Leslie doing crowd control type work around a grisly murder site late at night on a cold evening. While Leslie is off getting a coffee, Peter finds a witness to the crime. The witness is a ghost. Oh, and the dead man had his head knocked clear off with a single blow. Peter and Leslie are just finishing up their training period, and Peter is hoping to get onto the homicide team. Leslie gets that. Peter is initially assigned to paperwork for busier cops. Fortunately, while he’s out looking for the ghost, he comes to the attention of Inspector Nightingale. He’s the only cop in his special division. He’s a wizard. He deals with supernatural crime. So begins Peter’s story. He’s the first apprentice wizard in 70 years, and he and Nightingale share an old house with a massive library, a silent woman-shaped thing that does all the cooking, and a dog Peter adopted from the headless corpse. Midnight Riot covers Peter’s first two cases. One involves the murderer mentioned above. The other deals with a territory dispute between two river spirits who both claim to represent the Thames. What makes Peter unique is that for much of what he does, he has to follow police procedure. So, when he has to deal with a hostile spirit, he goes right to interrogation mode, since spirits aren’t that psychologically different from regular people when all is said and done. Peter also has some scientific training, so he comes up with ways to make magic work in the modern world. Much of what Peter knows about is more police work than magic, and the few basic spells he knows don’t amount to much before the story ends. Peter, who is mixed race, did have what seemed to be an inconsistency. He talks about his home life and childhood as being somewhat miserable due to his father, a jazz musician with a drug habit, being something that sounded an awful lot like a bad or even abusive father. Late in the book, Peter is forced to return to his parents’ house, and his dad is there and the two get along just fine. In fact, his dad seems more harmless and forgetful than anything else. It made me wonder why at least one river spirit was holding the junkie father over Peter’s head. It seemed at worst mildly embarrassing at that point. The book was fun, though I am not sure when I will be getting back to this series. I’m giving this one eight out of ten magically-destroyed cell phones.